Walter Tutt was headed to the store for breakfast yesterday when he noticed the house in the road. The 21/2-story building — weighing 115 tons — sat atop 80 hydraulic wheels and inched down Spring Street, making its way from its home of 100 years to a lot less than half a mile away in downtown Jeffersonville. The sight made Tutt forget his breakfast. PHOTOS BY CHRIS HALL, SPECIAL TO THE COURIER-JOURNALTom Popp delayed his morning ride to watch as the Willey House was relocated in Jeffersonville, Ind. “It’s pretty incredible,” he said. The house, which was built in 1902, was transported less than half a mile.The move and renovation of the building will cost $280,000 to $300,000. 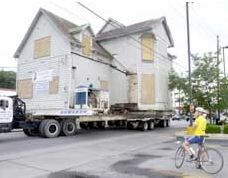 At 7 a.m. he stood at the corner of 10th and Spring streets, next to downed traffic lights and various utility cables and wires, and watched in amazement as the historic Willey House was moved down one of Jeffersonville’s busiest thoroughfares. The journey of the 2,900-square-foot Frank Willey House drew about 100 gawkers yesterday morning — people who woke as early as 5 a.m. to see a piece of history rolled down the street in an effort to preserve the city’s past. The house, formerly at 105 Sparks Ave., had faced demolition. Built in 1902, the Willey House had seen ever-expanding Clark Memorial Hospital next door eat up more and more of the land around it. Eventually, it was one of only a handful of residences left in the area, a remnant of the once fashionable middle-class neighborhood at the top of Spring Street. The hospital purchased the house a few years ago and had decided last year to raze it to make way for much-needed emergency room parking. But the Historic Landmarks Foundation of Indiana intervened. And the hospital agreed to donate the house — which it had used in recent years for storage — and $7,000 to see the building moved from the site to a vacant lot at 115 W. Chestnut St., next to the foundation’s office. Les Weedin waited to replace a line that was taken down. The house barely squeaked by several poles and electrical transformers. The gray, Queen Anne-style house will fit in with the older homes there, Stayton said. Others along the route yesterday agreed that moving it was a better option than knocking it down. The move took about three hours, slowed by dozens of overhead wires that crisscross Spring Street. The wires had to be either raised higher than 42 feet above the ground or dropped to the ground and surrounded by wooden pallets to protect them from being crushed. The work drew employees from Cinergy, Insight Cable and Ameritech, who worked for hours adjusting, removing and then reinstalling their lines. Meanwhile, Jeffersonville city work crews removed street lights and overhead traffic signals. Still, the house barely squeaked by several telephone poles and electrical transformers along the way. Tom Popp stopped his bicycle ride through downtown, circling around to watch the building as it inched past streetlights and signposts. “It’s pretty incredible,” he said. Nearby, Jacky Rescher and her husband, John, had brought their 4-year-old grandson Drew Etheridge to watch. Drew was familiar with the house because Jacky Rescher works at the hospital. He woke up early to see what he called the “house with wheels” roll down the street, as his grandmother took pictures that he could take to his preschool’s show-and-tell. The house is called the Frank Willey house after its first owner, but for more than 60 years, members of the Allhands family lived at 105 Sparks Ave.
For years, art teacher Elizabeth Allhands lived in the home alone until her death in the late 1980s, said Joan Siewert, her great-niece. Elizabeth, the youngest of three sisters, didn’t drive and instead walked everywhere — including up Spring Street to Mass at St. Augustine’s Church each day, Siewert said. The memory nearly made her cry yesterday. “This is like Elizabeth walking down the street the last time,” she said. Siewert remembers visiting the house as a child and being in awe of its rose garden, the separate breakfast room, its porte-cochere — a fancy carport-like structure — and the intricate old harpsichord inside. She said she was happy the building was being saved but added that it wouldn’t have the same meaning to her in its new location. “It won’t have the same significance in town,” she said. The move and renovation of the building will cost $280,000 to $300,000, said Greg Sekula, executive director of the Historic Landmarks Foundation. That money — much of which will go to pay work crews moving all the overhead wires yesterday — came from local and state grants, along with private donations, he said. Eventually, the foundation will use the Willey House as its office. It hopes to sell its offices at the restored Grisamore House next door and use the proceeds to pay the remainder of the cost of the Willey House move. Extra money will go toward a fund for the house’s future maintenance, Sekula said. But before that can happen, a lot of work will have to be done. The Willey House’s journey yesterday ended in a parking lot next to its new home. Today work crews will lower the house onto a hollowed-out spot and then will begin building a basement underneath the house, Sekula said. The landmarks foundation then will take to the task of rebuilding the three chimneys — the original chimneys were disassembled and the bricks saved for the job — repainting the outside and repairing the home’s tin roof, he said. The renovation will take from nine months to a year to complete. Sekula said it will be worth it. Private companies and people don’t often have the money to do such painstaking, difficult work, he said. And the foundation will gain a house that is almost entirely intact inside, with wooden trim and cast-iron fireplaces. “You couldn’t build a new building today that was like this,” he said. This entry was posted in Willey-Allhands House and tagged Willey-Allhands House on March 19, 2003 by Rob Jones.